Please feel free to share this with family and friends, especially those that were not able to attend our concert. 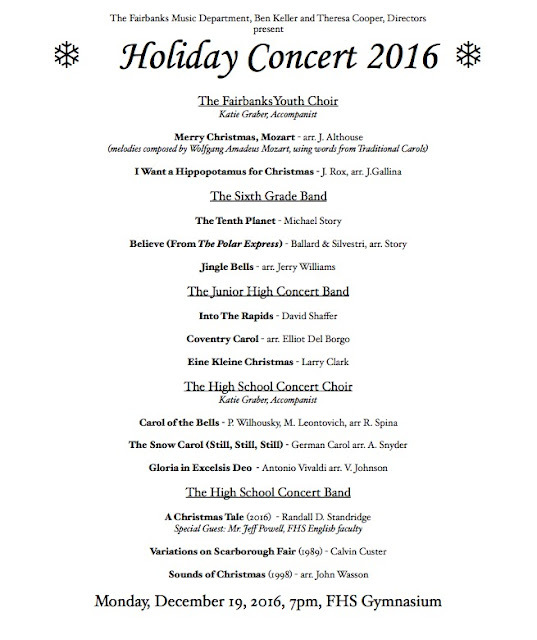 Fairbanks Music Department’s Annual Holiday Concert 2016 Monday, December 19, 2016, 7:00 P.M.
6th Grade Band You need to be seated with your family with your instruments and folder ready to watch the Youth Choir at 7PM. Immediately after the Middle School Choir’s program, go promptly to your performance seats on the gym floor. We will warm up on #147, 148, 149 in your book and then perform our program. After we are done, we’ll file out and then you will sit in with your family. Do NOT go back to the band room. After the HS concert band has concluded their program, you are free to go. Any and all Fairbanks Band alumni are welcome to join us at the pep band game on Saturday, December 17. Rehearsal is at 6pm in the band room. You'll be admitted free to the game...just sign in on the sheet. Many student band members will be there as well so don't worry if you're a little rusty. We've got you covered. Please message me and let me know if you need an instrument. Music will be available at the game. Spread the word to your band friends. I hope to see you all there!